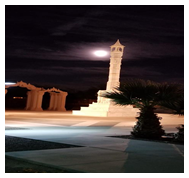 JAINA Newsletter:JAINA Convention 2019, JCSC & UCSB Signs Lectureship in Jain Studies, Jain Center.. 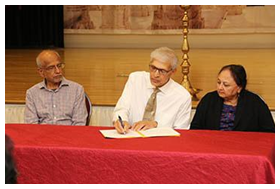 The Jain Center of Southern California (JCSC) and the University of California, Santa Barba signed Bhagwan Vimalnath Lectureship in Jain Studies at the JCSC. More details are given below. 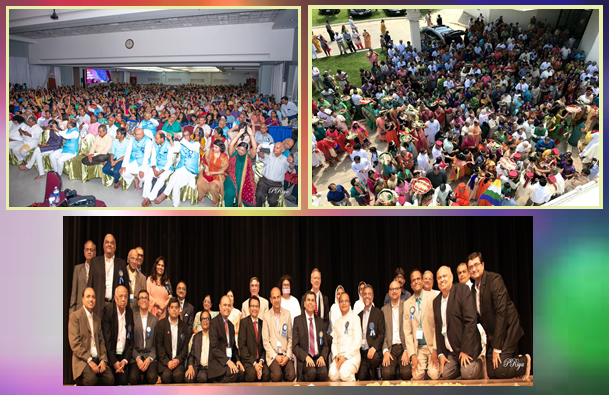 Around 4000 people from the US and outside attended the 25th Anniversary celebration of Jain Society of Metropolitan Chicago at Bartlett, IL. Scholars, Speakers, Political Dignitaries and Leaders graced the event with their presence. Details are given below. Jain Center of Greater Phoenix celebrated its second phase of the Pratishtha. This two-day event was attended by more than 800 people. More details are given below. Pujya Jinchandraji Maharaj Saheb was on a Dharmik yatra to the USA. During this yatra, he got a fracture in the left hand. Maharaj Saheb has arrived safely in Mumbai and will be operated in Hinduja Hospital soon. Watch a message from the Maharaj Saheb below. Q1: Who is Siddha Bhagwant? Q2: Where are the Siddhas? JAINA Convention 2019 preparations are gearing up! 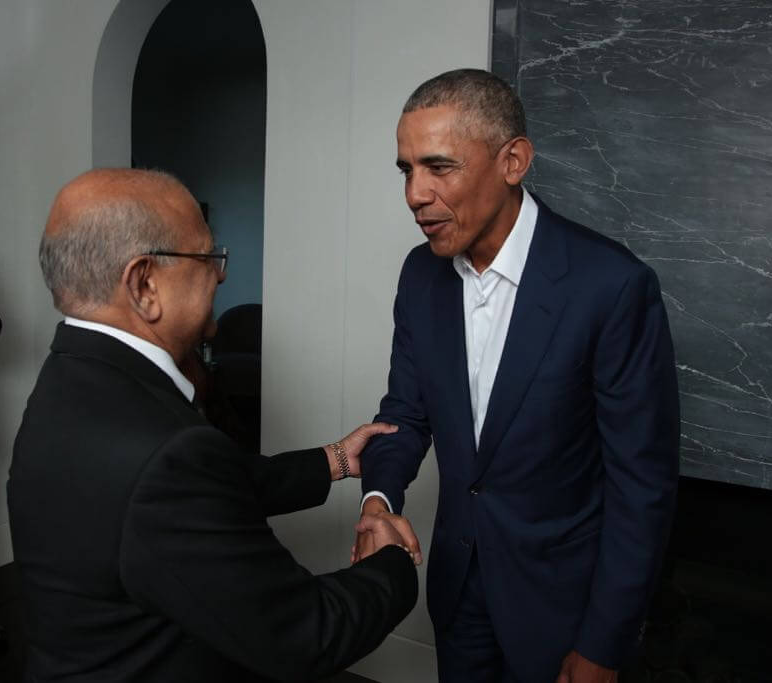 JAINA First VP and Convener, Mahesh Wadher along with Usha Wadher inviting President Obama to be a keynote speaker during the JAINA Convention 2019 at Ontario Convention Center, Ontario, California. On June 19, the Los Angeles Jain Community, the donors and officers of the University of California, Santa Barbra gathered at the Jain Center of Southern California and signed the documents to establish the Bhagwan Vimalnath Lectureship in Jain Studies at the prestigious University of California Santa Barbara (UCSB). UCSB has one of the largest Depts. of Religious Studies in the USA and now by establishing the Jain Studies program there, the vacuum of Jain Studies will soon be filled. The entire Jain Community is rightly proud of this initiative and thanks to the donors and the LA Jain Sangh for their vision and commitment to promoting Jain Studies at colleges and universities in North America. 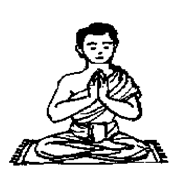 what is the place of prayers in Jainism? Since the Jains do not believe in God or in the existence of any outside Divinity controlling our fate, any idea of prayer would be irrelevant to them for two main reasons. Pujya Jinchandraji Maharaj Saheb was on a Dharmik yatra to the USA. During this yatra, he got a fracture in the left hand. Maharaj Saheb has arrived safely in Mumbai and will be operated in Hinduja Hospital soon. He is in good health otherwise. Hoping for a quick recovery. Recently, Jain Center of Greater Phoenix (JCGP) had second phase of Pratishtha after their Panchkalyanak Pratishtha in June. JCGP thanks to entire JCGP community and volunteers for making this event successful. This two-day event was attended by 800+ people. The center had 18 Abhishek, Cultural program, Shobhayatra, Pratishtha of four idols in Ahimsa Stambh and other events. After this Pratishtha they feel temple is complete and community is ready for next steps in its spiritual and religious journey. A 1: Siddha Bhagwants are those souls who are liberated from this world forever. A 2: Siddhas are at Siddhashila which is at the top part of this world (Lokakash).